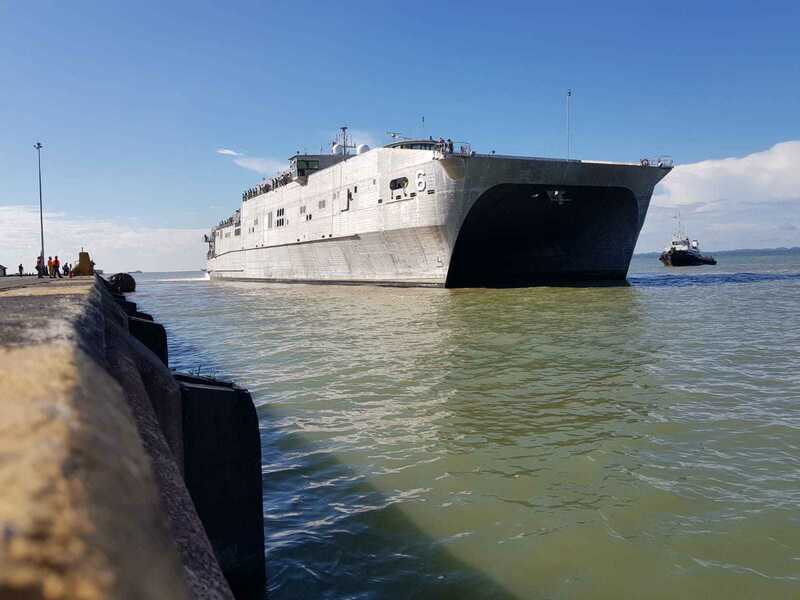 Expeditionary fast transport ship USNS Brunswick (T-EPF 6) arrives in to Tawau, Malaysia, on April 21, 2018, for a mission stop in support of Pacific Partnership (PP) 2018. US Navy photo. KUALA LUMPUR — The U.S. Navy’s Logistics Group Western Pacific/Task Force 73 is looking at new ways of using the Expeditionary Fast Transport (EPF) ships for operations in the Indo-Pacific, task force commander Rear Adm. Don Gabrielson told USNI News in a recent interview. “We are continuing to explore for the United States Navy how to really maximize the utility of the EPF, and we’re finding some really useful missions for these ships,” Gabrielson said. Currently, three EPFs are operating in the region: USNS Millinocket (T-EFP-3), USNS Brunswick (T-EPF-6) and USNS Fall River (T-EPF-4). One mission being explored is as a command ship for operations and engagements with regional nations. “It’s a very good capability and it may apply to many different scenarios for a staff element that requires to go to sea, particularly to places where they need to get there fast or where the waters are only accessible to shallow draft ships,” Gabrielson said. Three different target vessels will be used for this year’s exercise: two of them will be present throughout the whole exercise, while the third, an EPF, will be used at various stages of the exercise. The two permanent target vessels will spend the duration of the exercise maneuvering throughout the region, and participating nations will share information from their ships, command centers and information nodes as they track the vessels’ movement and conduct visit, board, search and seizure exercises on the target ships. SEACAT will also involve regional coast guards and maritime enforcement agencies participating alongside the navies of participating nations. While somewhat similar to past SEACAT exercises, Gabrielson said the repetitive nature of regional exercises such as CARAT and SEACAT was important because of the turnover of personnel. “The crews of these ships turn over each year, so these are routine events for all the nations to work together to get to know each other,” the admiral said. Touching on the Pacific Partnership 2018 mission, which began in February and is ongoing in the region, Gabrielson said “this mission is really impactful to the region as it does several things: it enables the HA/DR experts in the region to come together and train and gain improved understanding of not just each other and the capabilities and the way they operate but also in the conditions in which they operate in various places around the region,” Gabrielson said. 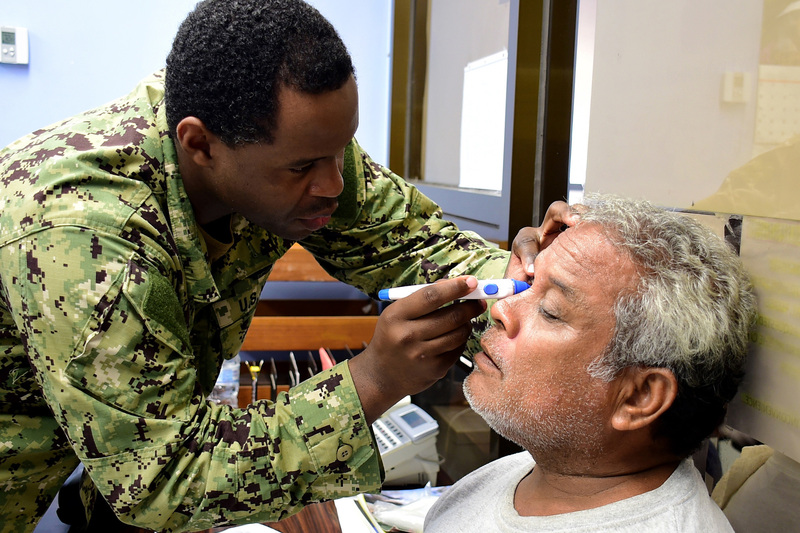 Hospital Corpsman 2nd Class Abokar Mohamed gives an optometry examination to a Yapese patient during a health fair at Yap Memorial Hospital in support of Pacific Partnership (PP) 2018 on March 30, 2018. US Navy photo. This year’s Pacific Partnership mission has two mission platforms – hospital ship USNS Mercy (T-AH-19) and the EPF Brunswick – and involves mission stops in Malaysia, Indonesia, Vietnam and Sri Lanka. An earlier phase in the South Pacific islands was already completed. “We have three EPF ships dedicated to the region here, plus USNS Mercy for Pacific Partnership, along with the other ships that pass through while on deployment,” Gabrielson continued.